Play-by-play announcer Merrill Reese at his induction into the Eagles’ Hall of Fame in November 2016. 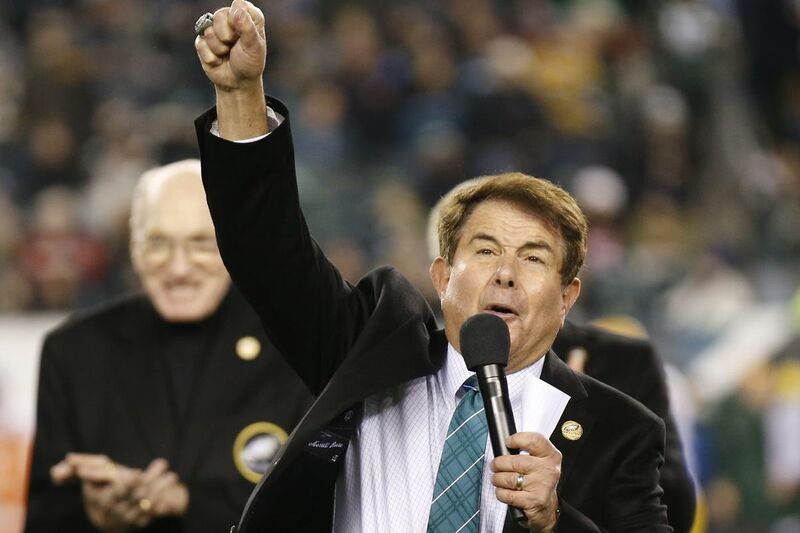 Eagles play-by-play announcer Merrill Reese has called a lot of big moments during his 41-year career in the booth, including last year’s Super Bowl victory over the New England Patriots. But few were as dramatic or improbable as Chicago Bears kicker (and one time Eagle) Cody Parkey’s last-second miss off the upright and crossbar — after the ball was tipped by the outstretched hand of Treyvon Hester — allowing the Birds to sneak out of Soldier Field with a 16-15 win. “Ball is snapped. Placed. Kicked. And it is… no good! No good! It is no good and the Eagles win!” Reese exclaimed on WIP and the Eagles Radio Network after Parkey’s kick bounced off the upright and into the end zone. “He missed it!” Reese’s broadcast partner Mike Quick added, both amused and totally surprised by Parkey’s miss. After the missed kick, Reese joked about Parkey’s uncertain future in Chicago after having reportedly signed a four-year, $15 million dollar contract (with $9 million guaranteed) last offseason. Over on La Mega 105.7 FM, Spanish play-by-play announcer and occasional WIP host Rickie Ricardo had an equally impassioned call of Parkey’s miss. “No señor! No señor! No señor! No señor!” Ricardo screamed after Parkey’s hit doinked off the upright. On NBC’s broadcast of the game, play-by-play announcer Al Michaels drew on the fact that Parkey had hit the upright five previous times this season (four in one game) as he called the improbable moment. “It hits the upright again! That’s impossible!" Michaels said. Of course, Michaels was in the booth back in 1991 during arguably the most famous missed field goal in the history of the NFL — Scott Norwood’s 47-yard miss as time expired during Super Bowl XXV, allowing the Giants to sneak away with a 20-19 victory over the Buffalo Bills. “Wide right!” Michaels famously shouted. Bears fans tuning into the game on WBBM Newsradio 105.9 FM in Chicago listened as play-by-play announcer Jeff Joniak went from elation to deflation in a matter of seconds as he realized Parkey’s kick didn’t go through the uprights. “I don’t even know how to respond to that,” former Bears guard and current radio analyst Tom Thayer said following the miss. As my colleague Marcus Hayes pointed out in a column prior to the game, Parkey had struggled this season, missing seven of his 30 field-goal attempts and three extra point attempts. That pales in comparison to the Pro Bowl performance he had as an Eagles rookie in 2014.